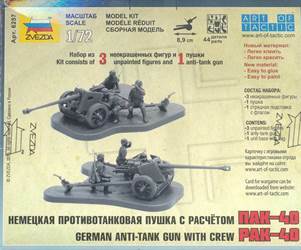 The Pak 40 became operational in February 1941 and was produced up until the end of the war. Early versions had stamped dish wheels like the Pak 38 and a Lenkrad (literaly: steering wheel) for easier manoeuvring. Later wheels were of the open type and had 6 or 8 spokes of varying designs. In 1943 the pneumatic brakes of the gun were omitted from the design. Very late guns (called FK40) had a modified gun shield to allow for indirect fire. The standard towing vehicle was the Sd.Kfz.11, or later the RSO, but other vehicles (like an Sd.Kfz.6 or Sd.Kfz.10) were sometimes used . The kit contains two rather big sprues in the (by now familiar) softish, but very gluable plastic. 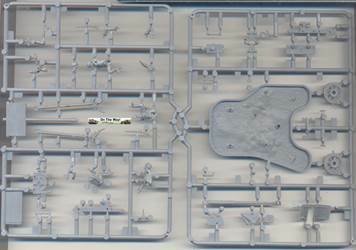 A large chunk of these sprues is taken up by a base and a wargaming flag. While the latter is of little use to the display modeler (except as a source of scrap plastic), I found the base to be very useful as a rig when assembling the model. You also get three figures. They have a very realistic anatomy and lively poses but as they come in multiple parts, there will be rather important seams to that need to be cleaned up and detail to be restored in its vicinity. 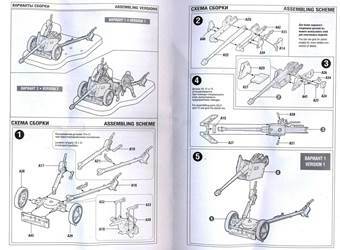 While Zvezda gives you the option of building the gun in firing or in transport mode, only the former can be chosen without any form of modification as the handles on the recoil spades need to be folded back and the lower shield (holding the shovel) needs to be folded up for the gun to be towed. 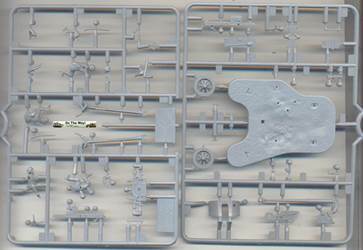 The kit doesn't contain anything related to the brakes (pressure cylinders or brake drums), has the convex eight spoke wheels, late style recuperator housing, and the most common type of muzzle brake. 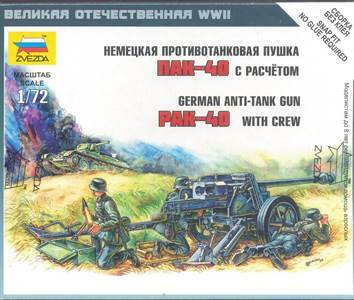 (See Al Magnus' review of the Dragon Pak 40 for more details.) This points to a gun produced in 1943, or later. Logically then, it also comes without a Lenkrad. When it comes to painting, this leaves you with no choice but to have the gun finished in dark yellow, with or without additional green or brown camouflage. When it comes to detail, I must say that this kit is way beyond what I would expect from a wargaming kit, but at an extremely attractive price. 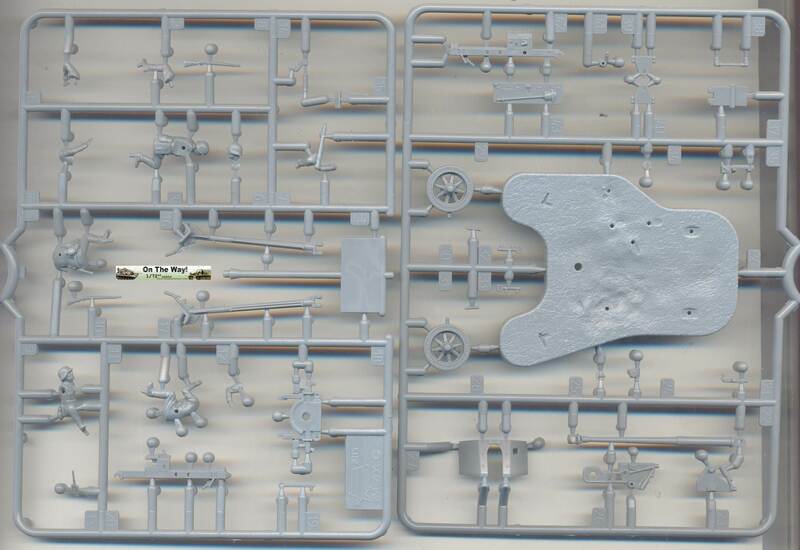 Not counting the figures, the kit consists of 41 pieces and is quite well detailed, up to the connecting rod between the two trail arms. Even the small brake light is there, although no wiring for it is rendered. That is not to say there aren't a few omissions. The tyre thread is absent for instance (I scribed mine, resulting in a rather worn and battered look), the small hand holds on the outside of the trails (just in front of recoil spades) are solid (and which I engraved to give some notion of depth) and the double gun shield is given as a single shield. The latter can be scribed in the middle to give the impression of being a double shield. Another omission is the sliding armor, somewhat scarve-like, around the top of the gun barrel. I added this from plasticard. I duly ignored a similar sliding piece of armor for the gunsight aperture. The cylindrical container for the demolition charge is not given, but it seems to have been an optional feature on the real gun . It can easily be scratchbuilt if so desired. The aiming stakes at the side of the trails were also enhanced with some scribing work. While the construction is straightforward with a tight fit (indeed most parts can be pressed into place without jeopardizing the solidity), the area around the breach is somewhat problematic. The way the kit is engineered, there will be a seam running through the breach that will require some very delicate filling. This area alone was responsible for more than half of the total assembly time. The braces for the shield (parts A30 & A31) were not very easy to put into place due to the limited tolerance in the area in which they belonged, but I managed to get them to stay after a few tries. The prominent assembly pegs at the bottom of the shield are virtually impossible to spot once everything is in place. I hesitated to replace the barrel with an RB metal replacement, which would have been an improvement. The kit barrel is indeed its weakest part as it has too much taper. 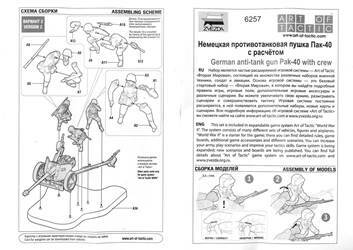 On the other hand, being cast in one piece, it doesn't suffer from mold shift, like the Dragon Pak 40, for instance. But, in the end, as the barrel would cost roughly the same as the whole kit, I decided against it and merely hollowed out the business end. Note that, if you put the barrel at a certain elevation, you need to remember to align the gunsight (part A24) accordingly. Unfortunately, by the time I had come to put the finishing touches on the gun, I noticed that the carpet monster had feasted on the small box (part A15) that goes behind the windshield. The last time I saw it, it was a nicely done part; I hope my scratchbuilt replacement does it justice. Measuring the kit against plans in , I found it to be very close to 1/72 with only the wheels perhaps a bit oversize (around 1/70). As a last remark: if you want to use the display base for more than a jig, note that the recoil spades are not nearly deep enough into the ground. 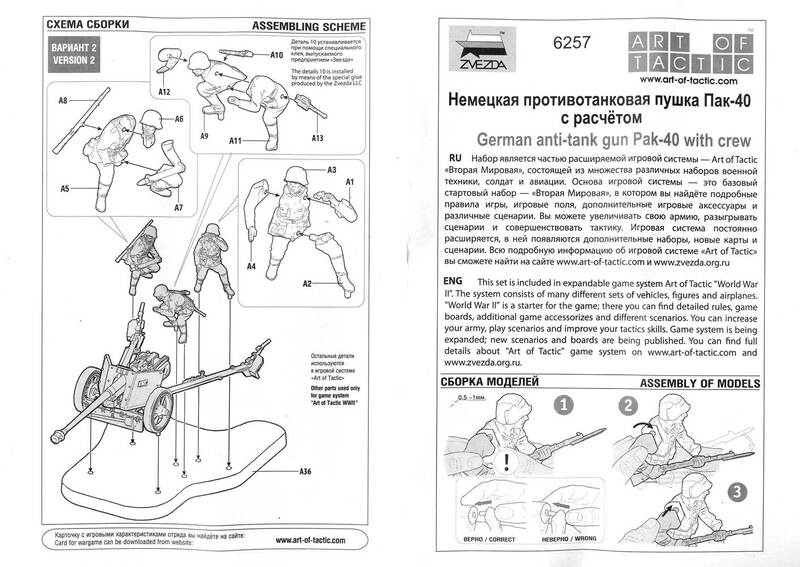 If you use it as a jig, then you should compensate for this as well, otherwise your gun will be pointing up more than you planned when you transfer the gun to a diorama. I didn't work on the figures yet, as I am unsure where the Pak will end up, but I think I will use them, due to their active poses. I might replace the round in the loaders hands with a metal one and add some spare rounds and empty cartridges (none are provided, sadly). I also might add the slings to the rifles, or leave the Kar98k off altogether. (Would the crew actually keep them on their backs while handling the gun ?) I will also need to restore quite a bit of detail, as mentioned earlier. I also noticed that, with the crew in place, you need to point the gun slightly to the left. 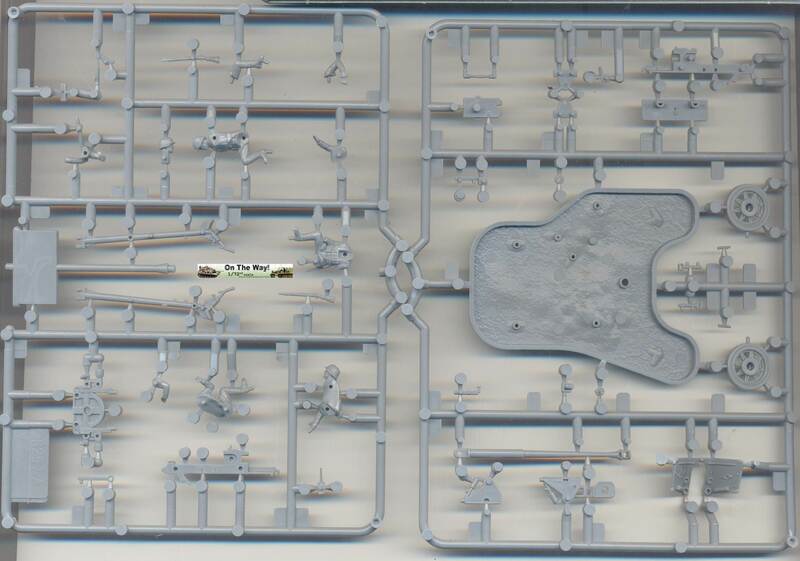 This is not only because the crew is fixed in place on the diorama base, but also because the gunner wouldn't properly fit behind the gunsight otherwise. I only managed to fit one foot of the commander with its peg in the corresponding hole, as the trail got in the way. You will also notice that you might need to adapt the creases and folds of some parts of the tunics where they meet the gun. Decals came from Fantasy Printshop and a Tamiya Bf109E. With partially assembled figures to give an impression. 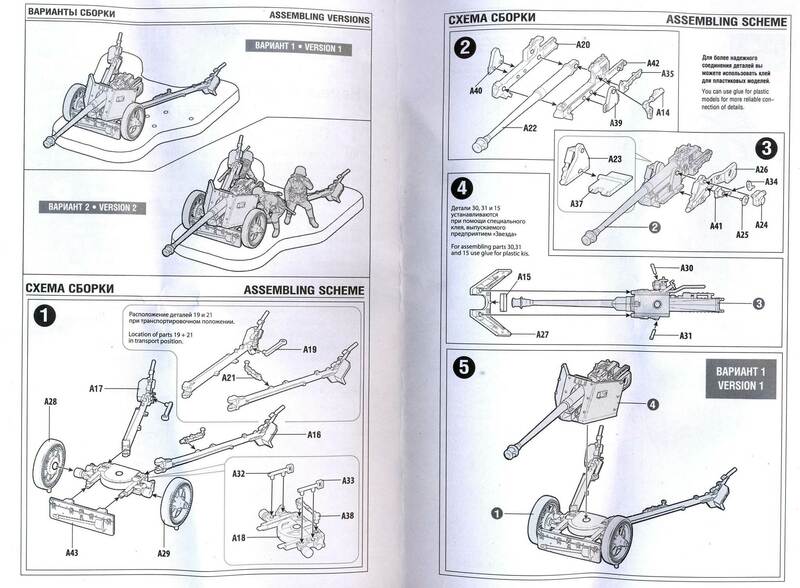 "Marder III" Panzerjäger 38(T) für 7.5cm PaK 40/3 (Sd.Kfz.138) Part 2: Ausführung H & 7.5cm PAK 40 Mot. Zug. V. Andorfer, M. Block, J. Nelson, H.F. Duske, T. Greenland, F. Schulz & D. Terlisten. Nuts & Bolts 18.